The Blue-winged Teal is one of many species of ducks which can be found on the islands of Aruba, Bonaire and Curaçao. If you really want to observe the animals now, while the dams are still dry, the water treatment plants on the islands are the best bet to find them. You will find the birds, sometimes in huge numbers, on the edges of the water tanks which make them relatively easy to observe, even though they are shy. Blue-winged teals can be identified by the visible blue patch on their wings, which is best seen when the animals are flying. 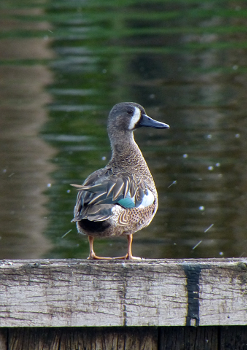 Male Blue-winged Teals in breeding plumage, get a white patch just behind the beak in the form of a half circle. Usually the males get their breeding plumage in the month of December, and many males on the island can be observed with the feature. No breeding activity has been reported for the island of Curaçao. But this can be subject to change as mating behavior has been observed, and a small group of ducks remain on the island the entire year. The food of these animals consists of water plants, but they will eat small water snails of insect if available. The natural surroundings these ducks usually live in are fresh water ponds or in stagnant water behind mangrove forests. The ducks reach a length of about 39 centimeters.